BUCKEYE – Arizona farmland has declined over the decades, leaving one generation of a Buckeye farming family concerned and another content. The Kerr family, longtime dairy farmers in Maricopa County, raised four generations of farmers in the Valley. Brothers David and Jerry Kerr, primary witnesses to the decrease in farmland over three decades, fear for Arizona’s agricultural future. The Kerr brothers’ nephew, Wes Kerr, feels differently. He believes new efficiencies and technology mean farmers can do more with less land. The generational differences demonstrate the changing nature of farms in Arizona, where the number of farms has grown over the last decade but available land and the size of farms is shrinking. David Kerr said the economy changed in the early 2000’s, bringing more retail and housing development and pushing farms to the fringes of urban areas. He could have expanded to make more money, but couldn’t afford to do so. So he took another route. “I sold my dairy in 2003, and have been in charge of Kerr Farm Tours for the last 12 years,” said Kerr, who works in the wheat industry. The program, which includes farm equipment and livestock such as cows, pigs, goats, is an exhibit at the Arizona State Fair. A dilapidated, abandoned dairy farm now sits in a dirt field behind his home, reminding him of financial difficulties. The average market value of agriculture products sold at Arizona farms dropped nearly 60 percent over 15 years, according to the USDA Census of Agriculture. The number of farms in Arizona has increased – from more than 8,500 in 1997 to more than 20,000 in 2012, according to that census. But the average size of farms has steadily dropped, from just under 3,200 acres in 1997 to about 1,300 in 2012. Total acreage has dropped from more than 27 million acres in 1997 to about 26 million in 2012. Kerr said there’s a byproduct of the loss in farmland: children are less likely to be familiar with Arizona’s rich agricultural history. “What we’ve noticed over the years with the farm tours is that the older generations come by and all of them will respond, ‘Oh, I remember that John Deere tractor because my grandfather had a farm,’ ” David Kerr said. A previous version of this story incorrectly reported the average size of farms in the state in 1997. The 8,507 farms in the state that year averaged 3,194 acres in size. The story here has been corrected, but clients who used an earlier version of this story are asked to run the correction found here. “We have generations of children now that don’t have that anymore, and it is very important for them to know where their food comes from and what these animals look like,” he said. David Kerr’s exit out of farming came years after his oldest brother, Jerry Kerr, sold out of the dairy industry two decades ago. When it came time to expand or sell out, Jerry Kerr did what was best for his farm and his family. “The economy of scale just wasn’t there for 200 cows, so I sold in 1996,” he said. He has another agricultural job, as field supervisor for the Arizona Cotton Research and Protection Council. It gives him another perch to view the Arizona farming industry. “When I started with the organization I’m with now, there were almost 300,000 acres of cotton,” he said. Cotton fields have seen an 85 percent decrease in acreage over two decades, Jerry Kerr said. “The sector that I’m in charge of, which is basically from Casa Grande, Central Arizona, and almost to the Colorado River; this year I had 43,000 (acres),” he said. 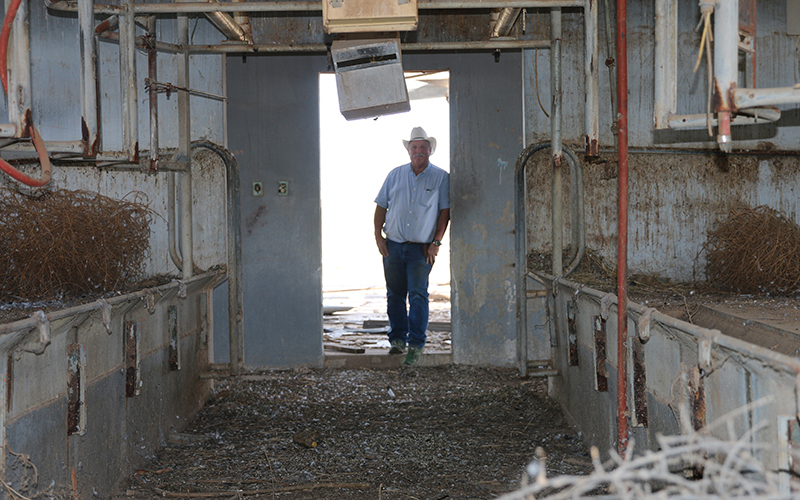 Jerry Kerr witnessed the decline firsthand throughout his 20 years in the cotton industry. “There’s three cotton gins left in Arizona now, and there were, when things were booming, probably 30,” he said. Wes Kerr, a fourth-generation farmer and co-owner of Kerr Family Dairy, sees the upside to the situation that bedevils his uncles. “Farmland is decreasing overall, and that is a really good thing,” he said. In 2007, most Maricopa County farms were less than ten acres, according to the Arizona Farm Bureau’s website. 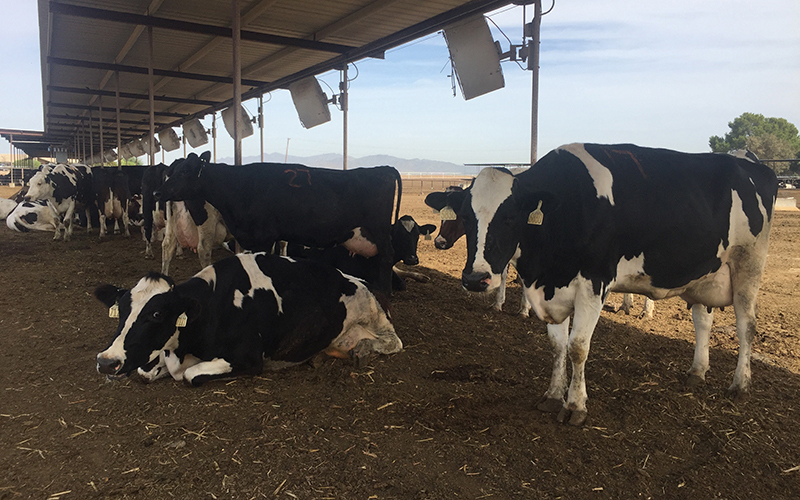 “In Arizona today there are about 65 families that still dairy farm, where maybe about 30 years ago there were close to 400,” Wes Kerr said. Current agricultural practices embrace sustainable farming, requiring less manpower, land and water. Arizona fields are laser leveled, he said. Tractors with laser guided blades smooth out fields evenly, leading to proportional water distribution throughout the fields, reducing water waste. Studying soil nutrients and breeding heartier crops also contribute to today’s efficient farming culture, Wes Kerr said. Nutritional diets, up-to-date animal healthcare and spacious living conditions led to increased milk production, Wes Kerr said. “Each cow produces about 75 pounds of milk per day,” he said. That amount fluctuates throughout the seasons, with decreased production in the summer and increased production in the winter. U.S. dairy industries produce more milk today with only one third the number of cows seen decades ago, he said. The rise of technology in farming has also led to job loss, forcing workers to migrate into related or separate industries. Younger generations in farming families are choosing career paths related to farming. days, Wes Kerr said. Jerry and David Kerr may have different views from their nephew, Wes, on changes in the farming industry. But the family agrees that farming culture is in their DNA.